On Friday 6th April I was honoured to receive the Nyenpo Lha Sum empowerment from His Eminence the 7th Dzogchen Rinpoche, Jigme Losel Wangpo, lineageholder. The empowerment was of three deities and transmitted their individual empowerments and a practice combining their abilities to remove obstacles, illnesses and harm from spirits. In the Gelugpa the nearest eqiuvalent of this practice is known as the Threefold Wrathful One, as already described on this site. 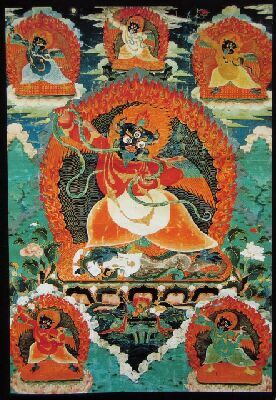 This Nyingma empowerment refers to these beings as the three Antidote Deities – Hayagriva, Vajrapani and Garuda. 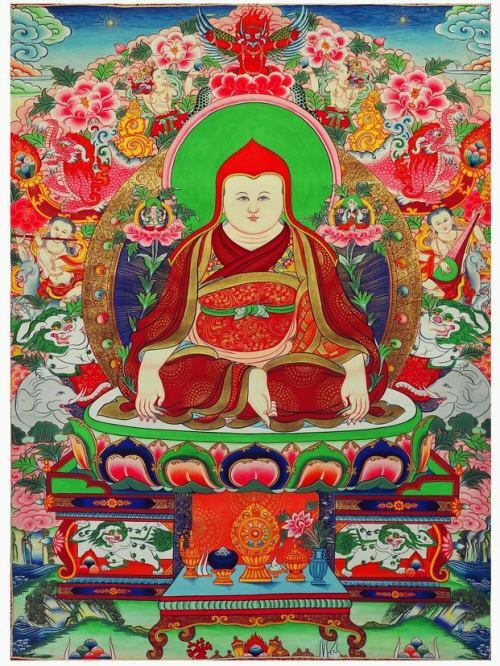 I have a practice, mantra and picture associated with this empowerment and will seek permission to reproduce limited information from it once Rinpoche ends his tour. As this practice is Mahayoga (equivalent to Highest Yoga Tantra) I can’t divulge much more without permission. The empowerment was especially potent for me as my father died the day before (on Thursday 5th). The empowerment enables me to help suffering beings in a new way and his death enhanced the realisation within me that made all the more urgent and important for the sake of all beings. we see Red Garuda above the head of the Jonang Master, Kunchen Dolpopa. The Red Garuda is usually emblematic of fire, so the reference may be to the blazing of the fire of enlightenment, or a reference to Garuda’s protective qualites. Kunchen Dolpopa was the first Jonang master to extensively teach Zhentong. In his most famous work, Mountain Dharma: An Ocean of Definitive Meaning (ri chos nges don rgya mtsho), Kunchen Dolpopa clarified the Zhentong view. These are referred to as the teachings of the “Heart’s Essence” (snying po’i don). As Kunchen Dolpopa’s Mountain Dharma and other Jonang texts were banned in the 17th century, they became extremely rare. In the 1970s and 1980s a few of these texts were re-discovered and re-printed, notably through the agency of His Holiness Dilgo Khyentse Rinpoche. and the snow-white pennants on your helmet flutter in the wind. that rises from our offering of longing. that distort and veil the splendor of your pure domain. and the sovereign dragon of the living earth. Show the true realm and the righteous rule of Shambala! Pure, real, undeluded, and uncontrived newness. that is the intrinsic life force of all beings. Swiftly, swiftly, please do this now! please remain with us and do not depart. Remain here, moving on the pathways of virtue. Remain here, resting on the raging flames of existence. Remain here, sustained by the flesh and blood of men and beasts. Remain here, subduing the fears and delusions of all realms. Remain here as our only sovereign and law. and sing to us in waking and in dreams. Drala: Tibetan: dra, enemy or opponent, and la, above; above the enemy; unconditioned wisdom and power beyond dualism; beyond opposites. Suvarna means ‘golden’, but gold is considered reddish in Asia. This wonderful image and scritpures were kindly supplied by Tashi Nyima. 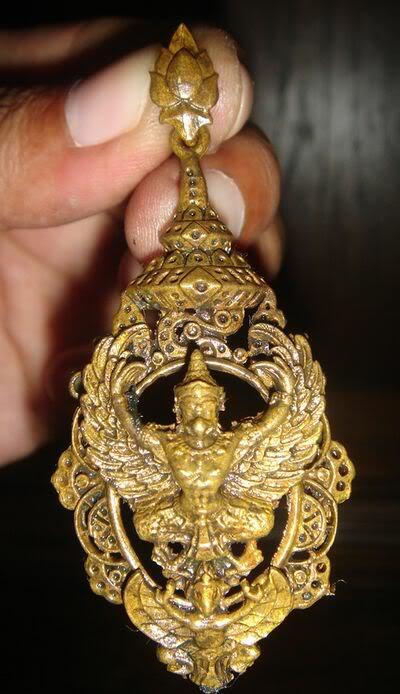 As with other Garuda Sadhanas, this one deals with defilements, illnesses and harm from spirits. Garuda reduces his size to that of Mount Meru in order to be accessible for this practice. I begin with Prostrations to the supreme deity Transcendental Wisdom Multi-Coloured Garuda, followed by Refuge in the Triple Gem. Equanimity, Loving Kindness, Compassion and Joyfulness. After generating Special Bodhichitta to become Transcendental Wisdom Multi-Coloured Garuda for the sake of all beings, I begin the core practice. As with other sadhanas, you are advised not to self-generate as Transcendental Wisdom Multi-Coloured Garuda without the specific empowerment or HYT empowerment – simply perform the sadhana with Transcendental Wisdom Multi-Coloured Garuda in front. From Emptiness, a seed syllable appears and transforms into the Naga King as a golden serpent, with my mind appearing above it as another seed syllable. Light rays from this seed syllable radiate and pacify all sicknesses, spirit harm, negativities and obscurations which may harm me. There then follows a detailed description of the self-generation and the forms of Buddha Garuda (white, at my throat), Jewel Garuda (gold, south), Lotus Garuda (red, west ), Karma Garuda (green, north) and Vajra Garuda (blue, east). The seed syllables are then visualised in my body and Guru Vajrapani is invoked, taking a position at the crown of my head. All the Buddhas and Bodhisattvas merge into Vajrapani. Offerings are then made to Guru Vajrapani, who then merges into me as the embodiment of the Refuges, and is asked for blessings. I then become Transcendental Wisdom Multi-Coloured Garuda Vajrapani embodying all the 5 Buddha races/families , all the Buddhas and Bodhisattvas. I ask the deity for blessing. (sometimes expressed as OM PA KSHIM SVAHA). Finally there is a Dedication. Here is a Youtube teaching by Tsem Tulku Rinpoche from a sadhana by Lama Zopa Rinpoche. The practice was taught during the SARS epidemic of 2004. Lama Zopa Rinpoche produced a practice from which Tsem Tulku taught. There are minor discrepancies e.g. ‘benza’ (Tibetan) instead of ‘vajra’ (Sanskrit). Here is the Youtube teaching, in which Tsem Tulku explains the practice for those who have not received HYT empowerments and therefore cannot self-generate as Lord Garuda. Tsem Tulku refers to Black Garuda as ‘BG’ at times in the videos. He switches from a light-hearted approach to a very serious delivery of this practice. The practice is one I use often, as it has great power. This practice should be done by someone who has previously received a highest yoga tantric initiation. If you do not have a highest yoga tantra initiation (even if you have a lower tantric initiation such as Great Chenrezig), you can still do this practice, but you do not visualize yourself as the deity. Instead, keep your ordinary form and visualize the deity outside of yourself – in the space in front of you, or at the crown of your head. If you are doing the practice with the deity outside of yourself, you will need to modify your visualization as indicated by the instructions in brackets, “[ ]”. Opinions vary about the validity of receiving an initiation remotely. I have attended initiations where many people sat around 50 yards outside of the building where the initiation took place, receiving it via the TV. This was live. Others have given initiations via telecast over the internet. There are two factors – space and time. Is it essential to be in the same place, or at the same time? Well, if the person giving the initiation is to be regarded as a Buddha, this activity transcends such limitations. The initiation is broadcast in 7 parts and includes instructions for those who wish to take the initiation and for those who simply want to view it and receive the blessings of that experience. In terms of deity interaction, the mudra works with the mantra to invoke the qualities and protection of Garuda. In terms of Yoga , the Garuda Mudra activates the blood flow and the circulation. It also helps alleviate exhaustion.  Clasp your thumbs and place your hands, the right on top of the left with the palms facing inwards, on your lower abdomen. Remain in this position for about ten breaths.  Later slide your hands to the navel. Remain there for another ten breaths.  Then place your hands on the pit of the stomach and remain for another ten breaths.  After this, place your left hand on the sternum, turn your hands in the direction of your shoulders and spread your fingers. This mudra is used to purify offerings and beings, and to protect against obstructions such as those form illness and spirits. One example is its use prior to Kusali Tsog. In addition to offerings traditionally made to a Buddhist Tantric Deity, there was formerly a ‘red offering’ of flesh and blood to Garuda. In Tibet, in both Bon and Nyingma historically regarded Garuda in some aspects as a ‘bdud’ demonic force to be propitiated with such an offering. This practice has now been abandoned although it is not known if isolated practices continue. GURU FOUNDER BLESSED ONE, TATHAGATA AND ARHAT, COMPLETELY PERFECT BUDDHA, GREAT VICTOR SHAKYAMUNI LORD. TO YOU WE BOW, GO FOR REFUGE AND OFFER GIFTS OH PLEASE BLESS US. AND CONFESS INDIVIDUALLY ALL NEGATIVE ACTIONS. AND PROMISE TO ACCOMPLISH A BUDDHA’S ENLIGHTENMENT. MAY EVERYONE HAVE EQUANIMITY, FREE FROM HATRED AND ATTACHMENT. HERUKA BHAWA, MAHA SAMAYA SATTÖ AH HUM. I go for Refuge to the Guru and the Three Jewels. Holding Vajra and Bell I generate as the Deity and make offerings. I rely upon the Dharmas of Sutra and Tantra and refrain from all non-virtuous actions. Gathering all Virtuous Dharmas, I help all living beings through the practice of the Four Givings. I would be very grateful to know where you found the text for the Red Garuda invocation at the beginning of this article.